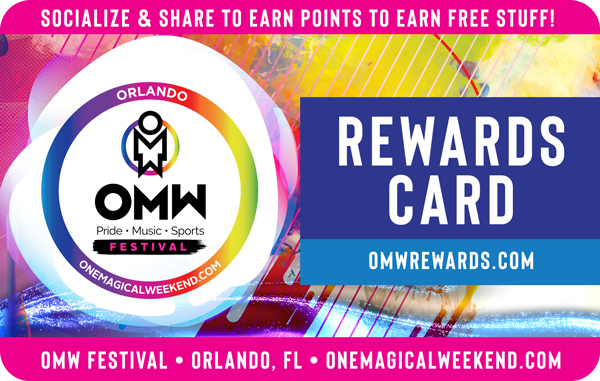 Share the Magic of One Magical Weekend 2019 with your world of friends and earn points! Take 2 minutes to register and become an OMW Rewards Member. There's no cost and no obligation. Socialize your link with your friends around the world... Instagram... Facebook... Twitter... YouTube... What's App... even face to face! Tell the people you talk to everyday. Now you're connected. Some people who visit your web link will purchase tickets and reserve a hotel room, and you'll earn points for every purchase. We'll keep track of the points you earn and your point total up to the big event. You can come back here and sign in to see how you're doing and to redeem the points you've earned. When you've earned enough points, you can redeem points for prizes, OMW-branded items, event tickets and hotel rooms for 1, 2 or all 3 nights! Earn 1pt for each dollar spent on ticket purchases and hotel reservations from your referrals. Post on Facebook and Twitter and earn 50pts* (post from this site only / limited to 1x per week). Grab a friend and join the DJ onstage at RIPTIDE Friday night for an epic pro photo session overlooking thousands! Make your friends RED at House of Blues with a backstage tour of the behind the scenes production and get photos with your favorite dancers. Strike a pose and meet & greet your fav queens at WIG on Sunday night! Friday, Saturday & Sunday with 3 of your friends in your own Private Cabana at Therapy pool party at Sheraton Lake Buena Vista. Escape the sun and enjoy fresh towel service and complimentary bottled water atop a plush daybed poolside.